NEW YORK, LONDON, PARIS – MAY 7, 2018 – NovaSparks™, the leading field programmable gate array (FPGA) market data company, today announced that its pure FPGA ticker plant appliance, NovaTick, can now automatically adapt its output data rate to microwave networks’ strict bandwidth requirements. Transmitting market data updates over microwave networks is notoriously challenging due to their inherently low bandwidth capacity. Heavy traffic periods magnify this challenge. Using patent pending bandwidth shaping and market data conflation mechanisms, NovaTick is able to conform to the networks’ limitations. With this critical new offering, banks and trading firms can now leverage their NovaSparks deployment to distribute market data over their existing microwave networks in the most efficient way. NovaTick’s microwave-optimized output feature is implemented in pure hardware which provides significantly lower and more deterministic latency than any comparable software solution. In addition to bandwidth shaping and market data conflation, NovaTick also provides the ability to aggregate trades and publish snapshots. Available for all 60 feeds of the NovaTick catalogue, the new interface comes as an additional output option, along with the already existing 10Gig Ethernet, PCIe DMA and NovaLink options. NovaSparks is the leader in FPGA-based high performance and ultra-low latency market data solutions for the financial industry. NovaSparks unique FPGA centric approach delivers sub microsecond processing latency including book building, even during market peak periods. 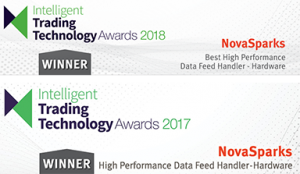 Available for over 60 feeds among the major Equity, Futures and Options venues across North America, Europe and Asia, the feed handlers are packaged in easy-to-deploy appliances offering an extensive fan-out capability for market data distribution. Founded in 2008 and backed by well-established investors, NovaSparks’ offices are located in Paris, France and New York, USA. For more information, please contact Barbara Rizzatti at 971-998-9404 or marketing@novasparks.com. Follow us on Twitter: @NovaSparksFPGA.